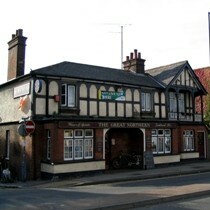 The Great Northern in St Albans is a traditional old pub at the foot of the London Road hill. It lost much trade when the old cinema next door closed. Only one real ale, Courage Best, but it's cheap. Named after the railway line that passes close by. Railway memorabilia on walls but strangly some of this relates to southern railway lines. Regulars of The Great Northern tend to be middle-aged to elderly and some of these can be rather rough looking men, often drinking on their own. Possibly not the best place for ladies on their own to visit. The curtains and carpet are rather old fashioned and could do with replacing whilst the whole place could do with being redecorated. Background music consisted of the radio (possibly Virgin radio) playing over the speakers. Now owned by McGowan's Irish Bars. Hopefully the pub will continue to be named the Great Northern to reflect the name of the local branch line that was closed many years ago. New Owners and completely refurbished in April 2015. Ratings above refer to the review from 2006 so needs to be re-reviewed. Their new website www.greatnorthernpub.co.uk shows a much smarter pub.